If training your dog is difficult, you might want to try a whistle. Especially with long distance commands, a whistle can be very effective. Whistles have several advantages when it comes to training. There are many reasons you may want to consider using one. Unlike the human voice, a whistle maintains a consistent sound. Using your voice, especially if you're soft-spoken, can get tiring. Your voice can become hoarse if you yell training from a distance. It can also change unconsciously based on emotions. Another benefit is that multiple people can use the whistle keeping the cue completely consistent for the dog. Training dogs at a distance, such as to come when called, can be difficult as the dog gets further away. 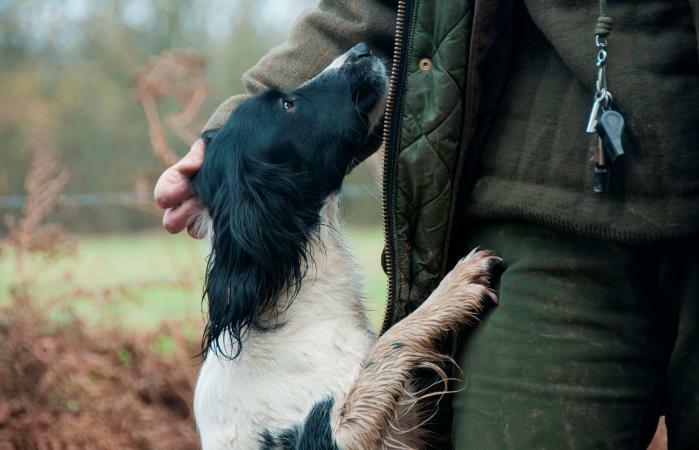 Whistles are also used by gun dog trainers, such as Pippa Mattinson, and livestock herders to perform a several behaviors when they are not close by. Some examples are asking the dog to make a left or right turn, stopping, tracking prey and fetching it. This distance training works because a dog's sense of hearing is far superior to a human's. They can hear ultrasonic sounds that a whistle can reach in the 23,000 to 54,000 hertz range. In comparison, you can only hear in the 64 to 23,000 hertz range. In addition to distance training, you can use a whistle to train other behaviors. This can include common behaviors like sit, down, and stay. Or you can get creative and use it to teach tricks. If you are consistent about the whistle cues, i.e. three tweets for sit or a long whistle for come, it can be used for just about anything. Sometimes a cue has been improperly trained, and the dog will not respond consistently. This may be because the cue has been used too often without pairing it to a behavior, and the dog is confused. Using a whistle can help you "retrain" a behavior. For example, if you've been trying to train your dog to come while yelling "come!" repeatedly, the word becomes less meaningful to the dog. Novice trainers can "mess up" a cue by using poor timing, a weak reward schedule, and/or increasing distance too quickly. By retraining the cue properly and pairing it with the whistle, you can have a very effective cue for coming when called. Whistle-training isn't perfect for every dog/trainer combination or situation you may encounter. Consider the following points. A whistle is only as good as the training that goes with it. If you've been having trouble with training your dog using verbal or hand cues, you should consult with a professional trainer to coach you on timing, consistency and reinforcement, according to Sarah Whitehead, a well-known trainer. If you move to using a whistle with no changes in your previous training regiment, you will find that it doesn't work as well as intended. A drawback to whistle training is that you need to have one. If you've trained your dog to come when called only using the whistle and you're out on a walk without it, you will have a hard time calling your dog if he runs off to chase a squirrel. It's best to train your dog with both a whistle sound and a verbal cue, as well as keeping one handy in several places. There is a belief that blowing on a whistle can be painful for dogs. This is somewhat true if the whistle is blown hard repeatedly so that the dog is irritated by it. Blowing the whistle strongly right next to the dog can also create a harsh sensation for them. These problems can easily be alleviated by using the whistle properly and following good training methods. The sound should not change. The sound should be able to reach a dog's ears at long distances. The whistle is sturdy and will not break easily. The whistle makes a sound you can hear but not a sound so loud it bothers your ears. The whistle is widely available, so you can buy another if you must. Buy multiple whistles so you have an extra on hand if you lose one. Consider a mouth whistle, also known as a sheepdog whistle, which one began with farmers working sheep with their herding dogs. If you follow proper training methods, a dog whistle can be a very effective dog training tool. A whistle can make a big difference in your communication with your dog and bring your training to the next level.